Some public services are best performed on a strictly local basis; those aimed primarily at privately owned property, for example. But others lend themselves best to a broad regional approach, and transportation is surely one of them. A transportation network needs central planning. Imagine the Interstate Highway system administered by counties. Public transit systems logically should be regional in nature, especially in this era where people expect to work at a distance from where they live. But two attempts in southeast Michigan to institute regional transit have run up against obstacles inherent in Michigan political organization. 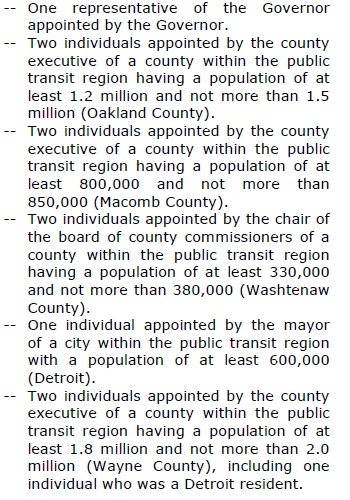 The two wannabe regional transit authorities are the Regional Transit Authority (RTA) and the Washtenaw Ride. Each of these must resolve a matter of governance in order to launch successfully. Governance is a word that has come into vogue lately. It alludes to the manner in which government conducts its business and especially the way it interacts with its citizens. Some of the important elements in this interaction are representation, taxation, and power. People generally want to believe that they are fairly represented at the decision-making level. If the body collects taxes, are they proportionate to the function of the governing body? And does this body exert a level of power over daily lives that is appropriate to its function, not dictatorial or burdensome? Note that the representation is based on a simple formula of equal representation for each geographical unit, except for the single appointee from the city of Detroit. The populations of the different geographical units are quite different. If the basis of the appointments was on an equal representation for each person (one man, one vote concept), the result would be very different. This first table shows the lower figure of population of each unit from the legislation. Note that the figure for Wayne County must include the population of the City of Detroit, since it is within that county. If we subtract the population of Detroit from Wayne County, it still holds its own as one of the highest populations among the five communities to be represented in the RTA. If we then apportion the number of seats based on percentage of the total population, Detroit and Washtenaw would both have only one, while the biggest two counties would have three. The problem with such a solution is that these are all sovereign entities, each with local constituencies and concerns. Pride is a factor, especially for Detroit. But self-preservation also makes joining an alliance as a weaker member unsavory. The possibility exists that the more powerful (in terms of votes) communities could force policies or requirements down the throats of the weaker ones. Another way to apportion seats could be by relative monetary contribution. But since this is to be funded by vehicle registration fees, it could be a shifting number over time, and it could also be a measure of the relative affluence of each community, which would presumably disadvantage Detroit, again unpalatable from a political viewpoint. Yet on the other hand, one suspicion that participants in a regional venture have is that this is not a cost-sharing opportunity, but rather a cost-shifting move. In other words, that the suburban counties (including Washtenaw) might be picking up the tab for Detroit. This has its own political calculus. Emphasizing the difference in monetary contribution could also lead to heavy-handedness on the part of the larger contributors, and to squabbles over what the exact proportions are, or other factors. The lesser contributors might also fear that their needs would be slighted in favor of the more powerful members’ priorities. The rationale for passage of the bill package and establishment of the RTA shifts depending on whose eyes you are looking through. To Transportation Riders United, it is a simple question of needing adequate bus transit service within the greater Detroit area. Bus transit in the Metro area has a sad confused history, as recorded in this detailed chronology. Two different bus systems, Detroit Department of Transportation (City of Detroit) and SMART (regional transit authority which serves Oakland, Macomb and Wayne Counties) do not interconnect adequately and leave many functional gaps in transit coverage. This is frustrating to everyone from riders to civic leaders to economic development planners. We explained in our earlier post that improving this coordination is apparently one motivation for the new RTA. Dennis Schornack, the Governor’s spokesman, intimated at one meeting that his intention (not expressed in these words) was basically to smack the two authorities alongside the head and make them behave. Proposed BRT routes into Detroit. Graphic by Dave Askins of the Ann Arbor Chronicle, used with permission. Pointer is Detroit Metro Airport. But this wasn’t what the Governor stressed when he made his presentation. Instead, he stressed the importance of rapid efficient transit within the metro area, including to Detroit Metro Airport. As explained in various venues, this would be in the form of Bus Rapid Transit (BRT) routes. The famous example of this is Cleveland’s Euclid corridor line. BRT routes in the purest form are segregated lanes with high-tech long buses, somewhat like a small train. They are necessarily express routes, especially over a long route like those being proposed here, so they don’t stop at every corner. The purpose is to enable commuters and business interests to travel quickly to the economic center in Detroit. This is favored by economic development planners. LaHood has said federal officials are prepared to offer $25 million for a proposed light rail project on Woodward “if the community can get its act together.” On Monday, he wouldn’t specify the amount, but noted one of the hurdles is the creation of the regional authority to coordinate mass transit. We’re willing to put on the table millions of dollars if this community can get its act together,” LaHood said of the Metro Detroit region… I met with the speaker of the house and senate majority leader and they told me that they support the idea of a regional transportation system and that legislation. There are many fine details to this legislation that deserve attention, including the question about the true priority for attention and funding. Is it the bus system? The BRT? The M-1 rail? The voters of the four counties will still have to approve the vehicle fees, and the description of what services are being provided will be critical. The populations of the three counties outside Detroit may not be persuaded by the M-1 priority, for example. New taxes usually hold out a promise for delivery of services. Will that be convincing across the region? And ultimately, the message to the voters will have to deal with the governance question successfully. Voters from each municipal unit will have to be convinced that they are signing on to a system which represents them and for which they receive at least some direct benefit. Of course, since Washtenaw County has such a small proportion of voters, our vote may not matter much. UPDATE: As reported by the Ann Arbor Chronicle, the Washtenaw County Board of Commissioners acted to withdraw support of the RTA on November 7, 2012. It is not clear what effect that action will have on the ultimate fate of the initiative. SECOND UPDATE: The Detroit News reports today (November 27, 2012) that the RTA legislation is having a rough go in the state legislature. Ironically, much of the story focuses on the possible loss of funds for M-1. The Washtenaw County Board of Commissioners passed a resolution this month saying the county wants to manage its own transportation systems and funds and let voters decide whether to join the authority. Ann Arbor and several townships opted against forming a countywide bus system. There are numerous issues, including funding and condemnation powers the new authority would have. The story quotes Mark Ouimet, who lost his re-election bid this year when Gretchen Driskell was elected instead. Ouimet was a major supporter of the RTA concept. THIRD UPDATE: News services report that the RTA passed the State Senate this afternoon (November 27), with amendments. Washtenaw County is still included in the region. SB 0909 passed 22-16. SB 0911 passed 22-15. SB 0912 passed 23-15. SB 0967 passed 23-15. SB 0445 passed 23-15. For further updates on this subject, see The SE Michigan Regional Transit Authority in Progress. This entry was posted on October 30, 2012 at 9:38 pm and is filed under civic finance, Regional, Transportation. You can subscribe via RSS 2.0 feed to this post's comments. You can comment below, or link to this permanent URL from your own site.